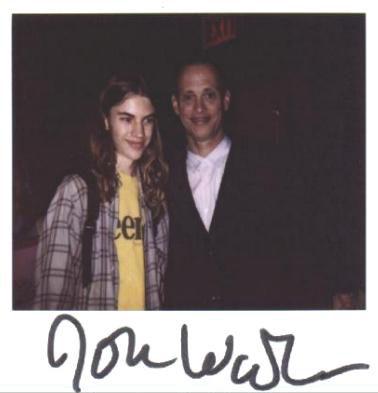 Meeting John Waters on my 16th birthday, at the premiere of Pecker. I first saw Pink Flamingos when I had just turned 14, and it changed my life. There was a sensibility to it and a humor that had existed only in my head before that, and seeing it externalized was a revelation. Its influence on my teenage life was enormous, and has a huge role in my sense of humor and who I am today. It's also almost singularly responsible for my obsession with movies. Naturally, John Waters was my favorite filmmaker for years, and even now, I'd say no other artist is as important to me. So basically, June Waters was unnecessary because I had already seen all of his films, most of them multiple times. But it's good for me to revisit those favorites every few years, and this was an excuse to do so, as well as revisit the ones I hadn't seen so often, like his last two films (Cecil B. Demented and A Dirty Shame), and Hairspray, which had been too saccharine for me in high school, but I was now able to appreciate as one of his best works. I had also never watched each of his films in a short period of time, in order, which is always a fascinating way to explore the arc of a director's career. So that's what I did, starting from the surprisingly entrancing Mondo Trasho, and including every documentary made on Waters, special features, audio commentaries (his are among the greatest I've ever heard), and even some movies he didn't direct that feature Divine or Edith Massey. I would've loved to have included Mink Stole's filmography as well, but it would've been too much, as it took me an extra month to watch everything as it is. Other than a newfound appreciation of Hairspray, I don't know that I really learned anything from June/ly Waters, but it was still very rewarding and great, and I will always love him dearly, and will continue to rewatch his films forever. View this list on Letterboxd. Next month: Augd Solondz and Augdy Sidargust (Andy Sidaris).